12th June 2009, 3PM, after Friday prayer, I fetched dR Ali & his nephew, Zaid at Batu 7. We drove to Masjid Sri Petaling to send Zaid, to his madrasah. The jam was horrible. We only reached Sri Petaling by 7:15PM. We then went to Ampang Park to get dR Ali’s SD cards. By 9:15PM we were already at Burger King Petronas MRRII. Bahtiar aka Pahat arrived soon after that. Later, Shamrul aka Abah joined us, then Emran, then Arey, Azli, Zilzal, Paei, Shuk & Remi. But Azli & Zilzal chicken-out…ha ha ha…joke only guys. They got things to settle & can’t join us. We move to Nuang entrace at about 11PM & arrived at 12 midnite. Paei & Shuk immediately prepare the breakfast for us while the rest went here & there searching good place to sleep. Some tried sleeping in their car, but finally everyone slept at the ‘wakaf’ there. I can’t sleep well. At 3AM rain poured down heavily. At 4AM, Taufik joined us. Everyone woke up & getting ready to trek. I packed two DSLRs, D200 with 70-200 f2.8 lens & D3 with 17-35mm lens; 1.5kg tripod, 1.5L water, flash & some dry cloth. Carrying Lowepro both Primus & Lowepro Toploader. About 12kg of weight. That proved ‘almost-fatal’ consequence to me. Pic #1: Arey giving a simple briefing. After a quick doa by dR Ali, 10 extraordinary adventurers started trekking on 13th June, 4:40AM. The first part of the journey was really testing our mental. Up and down walk from 200m absl to 500 m absl. At times, we reach 445m, but later we had to descend to 300m…..then up again, then down again….really-really mental! We reached the first campsite at 6:15AM. Most of us prayed our Fajr prayers there. Some who were a bit slow prayed before that. We stopped about 30mins & then continued to Lolo Camp (about 500m absl), after another 30 mins walk. We had to cross the river twice. Then we stopped for a breakfast. Here, two of our members decided to quit stay at Lolo only:D. One with cramp calf muscles, the other one I do not know why!! At 8:40AM, the remaining 8 members continued the journey to Pacat Campsite. Another gruelling 3 hours trekking up the slippery paths. Most people struggled to reach the campsite & I was the slowest. At about 100m vertical to reach the campsite, Shuk offered to carry my load. Thank to Shuk, I managed to reach Pacat Camp (about 1000 m absl), about 10-15 mins behind the earlier team. Everybody looked happy & enthuthiastic . We had a quick refreshment & started to summit at 12:00PM. Pic #4: We stopped many time. Pity to Shuk & Paei, the OGKL guys. We were told to go back no matter what by 2:30PM. We thought we can reach the summit within 2 hours time. How wrong we were. The trek was horrible. At many places, the treks were almost vertical. We were virtually crawling up. Even at 2PM we were at about 1380 m high, and still 120 m vertical from the peak. We didn’t even managd to reach Pengasih Peak (the pseudo peak). Based on our pace we estimated that we need another 1 hour to reach the summit. Thunderstorms heard clearly. The fogs were everywhere. We simply exhausted & scared looking at the condition of the path. By 2:15PM, after a quick discussion, we went back. Arey & Pahat were already ahead of us. So Paei went up to tell them that we are not coming & the rest go back to Pacat. We descended only 45-60mins to reach Pacat Camp. We had our lunch there. Thanks to Taufik for his complete food & stove. We prayed Zohor & Asar there. And we rested for about 1 hour waiting for Arey, Pahat & Paei to return. They arrived at Pacat at about 4:30PM. They already had their lunch at the peak. Pahat arrived at about 4:45PM, looking very exhausted. But I can see happiness & how proud he was!! Pic #9: Rest at Pacat Camp. Waitng for others. We then continued to descend at about 5:15PM. Me & Emran reached Lolo by 6:30PM. Others arrived 15 minutes later. By 7PM, me & Emran decided to go first. I carried my backpack again….and there were times I hope I didn’t do that and let Shuk carry it to the entrance!! After many stops, we reached the ranjer at 9PM. I managed to sleep for 15mins at the last rest area. Thanks to Emran for accompanying me. By 10PM all of us had cleaned up & had a good great dinner together minus Taufik who went back earlier. I travelled back to Kuantan with dR Ali at 12 midnite & reached Kuantan only at 5:28AM! Had to stopped many times because of too sleepy & tired. Overall, this is one great experience! We walked almost 17 hours. We suffered muscle cramp many time. Our physical & mental strength were tested. Tahniah especially to Pahat who managed to get to the peak! Many didn’t reached the peak but for the first timer & reaching just below Pengasih Peak is not bad what! If I wanna go again, I prefer to sleep at Lolo & trek up fresh. But I don’t think I will go again. Nothing great scenery to photograph up there. Nuang is THE place to test your mental & physical fitness but not a good place for photography. The landscape is not worth the pain. I would like to take this opportunity to thank all OGKL guys who were with us, guiding & helping us all the way. There are Arey, Paei & Shuk. OGKL website is available here. 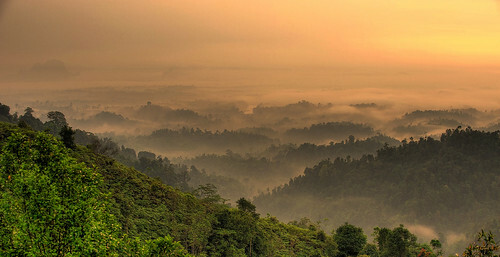 Game for a quick trekking uphill Bukit Panorama (320m) at Sungai Lembing? Those interested, please gather at the foot of the hill this Sunday, 24th (typo – sorry) 25th Jan 2009 approximately at 6:30AM, after Fajar prayer. We’ll do a quick warm-up & then proceed trekking uphill. Don’t take heavy breakfast before climbing. Best to have the breakfast up on the hill. Wide & tele lens plus a tripod are important gears. Bring Graduated ND filter if you have. It will be very helpful. The trip had been cancelled due to bad whether! I already prepared to go actually…..